Almost a decade and two continents apart, a little blonde boy and a little blonde girl dreamt of seeing a world very different from their own. From his city in England, he would paddle a bunk bed full of creatures down the Amazon River and outside a small South African town, she would scrunch her eyes up and turn to the sun, wondering what it would be like to sleep in a place where it barely sets. Around 30 years later, it turns out, they’re both travel writers. Below are two stories, his and hers, on the games children play and the travel dreams they shape. A quiet need to travel has always run in my family’s veins, but I can’t say for sure when it was that I first felt it in mine. Perhaps, as it so often is with these things, the instinct to roam was always just there. You see, I come from a line of wanderers. My maternal ancestors were among the first Europeans to climb off the boat in Durban harbour, and you’ll now find McKenzies in almost every farming district in what has become KwaZulu-Natal. My paternal grandparents brought their thick Yorkshire accents with them to Africa and my father was, as he once put it, “born in the first half of the last century, in a country that no longer exists”. South Africa is the fourth country he has lived in; it’s where he met my mum, and is where I was born. I grew up knowing there was a wide world out there, but couldn’t quite work out how I fitted into it. 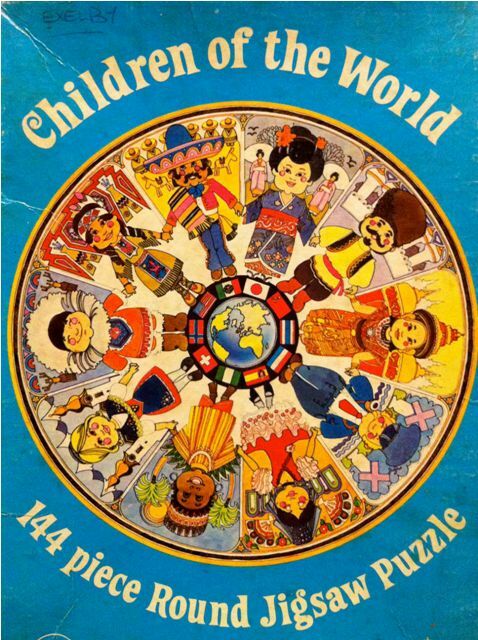 My favourite jigsaw puzzle captured that confusion: it was a round one called “Children of the World” – 10 animated kids holding hands around a globe, all wearing their national dress. I’d stare at it for hours, wondering just who those children were; because none of them looked like me. My formative years were spent dancing the Highland fling in McKenzie tartan (in the same kilt my mum wore when she was a girl); making mud pies with rich African soil; and giving my dolls American accents – because that was how people spoke on TV. My granny grew English roses in her garden; my dad built us a house in a tree native to Australia, and my siblings and I have names taken from the African bush. We lived on a nature reserve and, my parents tell me, I knew the Latin names of some animals before I knew the English. I still remember a few. Some nights, my mum would sing us to sleep with a Zulu lullaby; other nights she’d choose English nursery rhymes. We had shelves full of books at home, and it was likely their pages that turned the instinct to travel into conscious thought. The wild stories of animals reinforced the world I already understood; what fascinated me were stories of places where children were sent to bed while the sun was still shining, and where snow covered entire landscapes – not like the hail we got in summer storms, or the frost in winter mornings, but white snow so thick you could pack it into balls and build men from it. It seemed a wonderful, wonderful world. The line between remembering what I was told about the world and becoming aware of the need to see it for myself blurs somewhere in the early Eighties. Around that time, my brother and I could be found creating a universe in the trees, or wandering down to the very end of our driveway with our penknives and sandwiches packed in a fabric pouch hanging from the end of a long stick and swung over our shoulders. Of course I didn’t know it then, but it would be almost two decades before I stored my penknife in a backpack and stood under falling snow, and further three years before I wore sunglasses long after most children’s bedtime. Since then I’ve travelled to six of the countries from my favourite jigsaw, and have collected passport stamps from more places than I once knew existed. Every time I travel, without fail, I see an animated version of myself – blonde pigtails and wearing long stripey socks – standing triumphant on top of a globe. It sounds silly, I know. But it always feels so, so good to put the pieces of my own puzzle together. A dark dank jungle river. A boat crawling with wildlife drifts down the current, heading toward lands that have never been seen by the eyes of outsiders. A small boy squats in the stern, brow furrowed and eyes straining ahead. He dips a paddle into the current, wary of crocodiles but knowing that his faithful dog, standing alert in the bow, would sound the warning. Somewhere down there, around shadowy bends draped with hanging fronds, lies the fabled city of Eldorado and the domain of the lost tribe of the Amazon. It is probable that many of our travel fantasies – and certainly a great many of our preconceptions – stem from our childhood games. As I steered my make-believe bunk-bed boat down the great river (it was always the Amazon) I fixed images in my mind of jungle rivers that were so vivid that I believe I can still see them now. Or perhaps they turned out to be actual places that I have since visited in real life on one of several expeditions. Nor did I yet realize that Eldorado was just a similarly childish fantasy of adults of an earlier age. It was only much later too that I heard the disturbing legend of how the Amazon women archers cut off their breasts so that they could shoot straighter. I can’t remember where I first read that but I still recall the shock as if it were a direct attack on the character of my early travel companions. I had grown up in West Africa and I don’t recall embarking on any of these imaginary explorations while we still lived there. Perhaps I was too young or maybe it was simply that Africa supplied enough sensory stimuli all by itself. The imagination kicked in after we moved to Newcastle (England, not Australia). I remember at a later age leading the local kids on several “real expeditions”, provisioning for the day and trekking with our backpacks through the woods and across the valleys to other villages. On one occasion we were actually attacked and beaten up by what is probably the only truly “hostile tribe” I ever came across. It was only last year that I finally fulfilled my ambition to travel up the Amazon. Of course the world’s greatest river surpassed many expectations, just as it fell immeasurably short of others. It was a bright and shiny world of make-believe then and it is not right that it should ever be forced into comparison with a necessarily tarnished real world. I believe those early trips in my mind were a great part of what formed my character – for good or bad – in later years. It is important that children should make-believe and I wonder in this age when virtual reality hits us from every angle whether they do it enough. I asked my own seven-year-old daughter what she plays at school. Lucia and her friends hate shopping but assume that they will like it when they are older, so the first travel fantasy that springs to mind is of shopping trips from their homes in Spain to glitzy malls in London, Paris and New York. I can only hope it’s a phase but girls will be girls and she can make her choice. Then, to my relief, she remembers another place from vague stories I told her about an assignment I had in Rajasthan. I don’t normally hang out with such celebrated characters but I had been the guest of a certain Raja and my tales of turbaned royalty, dusky princesses and prancing warhorses seem to have stuck in her mind. She wants to see palaces, princes and dancing girls in what she calls “Jakisthan”. Still a long way from my sweaty jungles, but we’re getting there. While there’s make-believe there’s hope. To see other stories from our Parallel Worlds series, please click here. Narina Exelby is a South African freelance writer and editor who swopped stability in Cape Town for a life less ordinary. She doesn’t live anywhere in particular, and home is where she drops her kitbag. Narina writes travel, lifestyle and health features for numerous respected magazines around the world. Lovely post. I’ve been meaning to write a similar one, about how my gran inspired me with stories of her travels.